The adrenaline rushes as mushers with teams of 14 dogs compete for an international sled dog race, spanning 900 kilometres in two weeks. The spectators watch the amazing dog-musher bond, where the musher commands his team of 14 dogs with his voice…here’s the story of La Grande Odyssée Savoie Mont Blanc from dream to reality. La Grande Odyssée Savoie Mont Blanc is an international sled dog race spanning 900 kilometres in French Alps and Swiss Alps. La Grande Odyssée Savoie Mont Blanc is intended for mushers with teams of 14 dogs who are experienced in long- and middle-distance. The course takes the teams to 20 ski resorts in France. For each of the 10 stages, time-trialed (every two minutes) or mass (in parallel) starts bring thousands of spectators to the Savoie Mont Blanc region. The race includes three completely independent encampments: one in the first week and two in the second week. First they were two… The journey of La Grande Odyssée Savoie Mont Blanc has been phenomenal and interesting. In 1998, Henry Kam (head – KTT, a hi-tech company) and Nicholas Vanier became friends. For many years, Henry had been supporting nature-adventure sporting events while Nicholas was preparing to cross Canada with his dogs and KTT was one of his partners. In 2002, Nicholas was preparing for the Yukon Quest, the legendary 1000-mile race linking the Yukon Territory to Alaska, when Henry asked, “Why don’t they have this in Europe?” Nicholas replied, “Because no one organises it.” The two decided to organise a similar race in Europe. Together they left for the Yukon Quest (between Maska and Yukon, it is a sled dog race of 1000 miles), Henry as a voluntary worker for the organisation. This was a ‘learning’ experience for them. The decision was made: La Grande Odyssée will be the greatest race Europe had ever known. Then they were three… Dominique Grandjean, a well-known veterinary surgeon and a specialist in Huskies, with experience in organising races, joined the founder team. Three complementary expertises therefore came together: the champion’s expertise, knowledge of animals and marketing and organisational expertise. Thus, it was decided that La Grande Odyssée would take place in the Portes du Soleil (Haute Savoie, France and Switzerland) and Haute Maurienne Vanoise (Savoie). Then they became 20… In 2004, there were 16 French ski resorts and four Swiss ski resorts involved in creating 1000 km of routes, 90 percent located outside the skiable areas. Then they were 500… On 7th January 2005, 18 best mushers in the world, representing 10 nations and accompanied by their 300 dogs, exceptional sports dogs and men, were in Avoriaz for the start of the first event. For organisational purposes, a team of 50 people had been created – more than 200 professionals and 250 Alpine huntsmen were involved. Some 20 partners offered their support, including Pierre & Vacances, the Ademe (French agency for the environment and energy management) and Eco-Emballages. This first event was a great sporting, media and popular success, despite the numerous problems with organising any first event. It was confirmed: La Grande Odyssée, this great sporting event, matched the objectives of the Portes du Soleil (a ski-sports destination in Alps) and the Haute Maurienne Vanoise (a ski resort) in terms of image and values. Then they were 1000… The second event in January 2006 had become the main theme for the winter communications strategy of the entire region. It enabled people to discover that the mountain is beautiful, that it can be used in a gentle and non-aggressive way and the values of authenticity, courage, and respect for the environment have a high educational value. La Grande Odyssée attracted more than 70,000 spectators and 1,000 people who were involved in this second edition. What’s more? La Grande Odyssée became the medium for many ‘edutainment’ campaigns: 1,000 primary school children from Savoie were invited to take part in an educational project, conferences were organised to promote eco-citizen initiatives. Then they were 1,000 and 1! In October 2006, the Savoie Mont Blanc brand name was chosen for the national and international promotion of all the tourist destinations of Savoie and Haute Savoie in summer as well as winters: 110 ski resorts, as well as the lakes, open spaces and national parks. The dogs running this race are the most endurant animals in the world. They can run for hours, at a high speed in cold weather, but to reach this level, it requires great breeding, accurate training, feeding and most importantly the building of a strong bond between the dogs and the musher (man driving the sled). It is very important to notice that the musher drives his team only by his voice. He holds no leash or whip. The only link between the dogs and the musher is the voice. The dogs in front of the team learn many commands (direction, pace, etc) that they follow when asked by the musher. So, it’s only the trust and the love that the dogs have for their mushers who make them run. There is no other sport than Mushing (name of dog sledding sport) where man and dogs can share the effort so much. It’s really the ultimate activity for those who want to share an adventure with their best four-legged friends. The majority of the dogs running La Grande Odyssée Savoie Mont Blanc are Alaskan Huskies. The breed is still evolving as the mushers are still breeding the best dogs to increase the capacities of these dogs to run for a long time speedily in cold weather. No other dogs can stand the performances of the Alaskan Huskies. On the musher’s side, the men and women running La Grande Odyssée Savoie Mont Blanc are true athletes as they need to help dogs to travel 750 km of mountain trails in 11 days of the race. There is a 54,000 Euros purse shared by the Top 10. The special awards include Best Dog Care (to the musher who has shown the best care to his dogs all along the race); Rookie of the Year, Best Ranked Musher (among those who are running the race for the first time); Sportsmanship Award; Best Siberian Husky Team; Best Climber; Fastest Team on the Three Longest Uphills of the Race; Friendliest Musher (chosen by the staff); Friendliest Dog (chosen by the veterinarian team); and Red Lantern (last musher to finish the whole race). The race: Timed competition of teams of sled dogs who pull a sled with the dog driver or musher standing on the runners. The team completing the marked course in the least time is judged the winner. Popular in: Arctic regions of the United States, Canada, Russia, and some European countries. 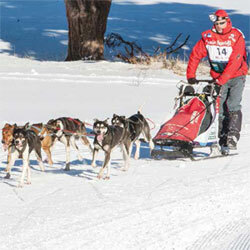 Types of sled race: Sprint (4 to 25 miles/day), mid-distance (100 to 300 miles), and long-distance (300 to more than 1,000 miles). First heroic expedition of sled dogs: Dog team of Alaskan postal service carried vaccines for a small town in Northwest Alaska, Nome in 1929 to save the residents from Diptheria, where even aircrafts could not fly due to harsh weather conditions. Breeds: Earlier, all kinds of breed were used for sled race, including Saint Bernard. But, gradually Siberian huskies took over as they are faster and can withstand the harsh climatic conditions. Major sled races: Iditarod Trail Sled Dog Race in Alaska; Ivakkak in Nunavik, Quebec; La Grande Odyssée in French Alps; and Yukon Quest from Fairbanks, Alaska to Whitehorse, Yukon one year then Whitehorse, Yukon to Fairbanks, Alaska the next. Care for K9: Like all athletes, the Siberian Husky is also prone to twists, joint sprain, muscle tears, sore soles, stress diarrhoea, etc. Mushers take special care of their sled dogs. They are fed a high-energy nutritious diet and they are kept in shape all the year round. Mushers learn how to massage their pooch’s feet so that they can help them when the need arises. They also make them learn basic commands and are taught how to work as a team. All these dogs are well groomed as well and are regularly taken for their health check-ups to their vets. Radek Havrda from Czech Republic is the only musher who has won the race two times, which is an amazing feat. Next La Grande Odyssée Savoie Mont Blanc race will be held from 11th to 22nd January 2014. (Annabel Kam is Responsable Communication et Relations presse at La Grande Odyssee Savoie Mont Blanc, Montreuil, France). Large dogs with mesmerising oriental eyes, quiet but intelligent, Akitas form excellent companion animals. An Akita named Hachiko became immortal after he patiently waited at the railway station for his master to return for almost 10 years, oblivious of the fact that his master had died when he was at work. A statue of Hachiko still greets everybody at the Shibuya Station in Japan. The Akitas are strange dogs… when I bought my first dog; it was like a drug (positive drug!!!). I’m just not able to do without them!! Their personality, the honour that they have in their soul, have me spellbound! !” told Debora enthusiastically. The Akita is a majestic dog who is a beauty to behold. His striking features include the gorgeous big bear like head, the hooded small ears that follow the crest of the neck, the wonderful bone and the stunning full tail that is always large and full, set high, carried over back, full or double curl. “Everything about them is sensational, right from their beautiful head to their substance and overall balance,” added Dave. “When I see their oriental eyes, so deep and black, I fall in love! Akitas are so elegant in the movement, there’s no other like them!” further added Debora. The height of males is 26-28 inches while that of females is 24-26 inches. They are available in different colours, ranging from white, brindle or pinto. 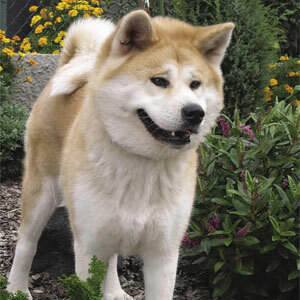 “Akita is a very powerful dog, with high dignity, very proud and serious, quiet but with pure intelligence,” told Debora. Akitas are loyal companions, besides being fantastic watchdogs. “Akitas on the most part are aloof. This however shouldn’t be confused with a standoff temperament. Akita is a proud dog who likes to be the leader of his pack or family. If you show the Akita leadership and loyalty they will repay this tenfold,” added Dave. “If trained correctly, the Akita will be good with children. This must be a two-way process though; with the child treating the Akita with both respect and good behaviour. A word of warning must be the Akita will regard the child as one of his pack, so care must be taken when other children are visiting. The Akita will look to protect his pack children against other people or children and he may get confused during normal children’s boisterous nature,” he added further. “Akitas are very intelligent and can outsmart humans. These dogs really do think and make choices for themselves. Due to their intellect and single-minded nature, they require a lot of patience and most definitely consistency in our approach,” told Panayiotis Tsingos of Shohago Japanese Akita Kennel, Greece. They need to be groomed daily to remove any surplus hair. Thick short coats of Akitas consist of two layers, which normally shed once or twice a year. Once the shedding occurs, it may continue for some weeks, it’s very important to keep brushing them on daily basis. It should be kept in mind that Akitas don’t need excessive bathing. But in order to prevent any excess hair, give your Akita a bath right after the second week of shedding. Grooming also helps in developing interaction with your pet and it is a daily treat for them. “People sometimes make the mistake of over exercising young Akitas too much; they need to be out and socializing but shouldn’t be over exercised due to them being a slow maturing breed. When they are fully mature, then is the time to start giving full exercise, as they like nothing better than a good walk. A word of caution, though as a rule, Akitas shouldn’t be walked off the lead as they can have very selected hearing and only come back to the handler when they want,” added Dave. “The Akita usually likes playing with a football. They seldom play fetch and retrieve for long as they easily get bored,” told Dave. “A large dog, they are not suited for inexperienced owners and need kind but firm guidance and training. Also, they are not the easiest dog to train as Akitas are independent thinkers and clever too. But when trained, they are an absolute joy to own,” told Malisa and Craig. “I live with my several Akitas and it’s a life-time experience!,” added Debora happily. Some of the hereditary problems include hip dysplasia and eye problems. In Japan, Akita is termed a “national treasure” as an Akita in a home is believed to be a symbol of good health, prosperity and good fortune. “Having had the breed for a long time, and also numerous Akitas throughout that time, it is amazing to see their traits from a five weeks puppy all the way to their older years,” told Dave. “You can bring home an Akita if you love this breed, not for fashion… and you will be happy and satisfied for all life,” concluded Debora. (With inputs from Malisa and Craig Moffat from Australia; Dave Chapman of England; Debora of Dei Laghi Tailly Kennel, Italy & Panayiotis Tsingos of Shohago Japanese Akita Kennel, Greece). http://www.dogsandpupsmagazine.com/wp-content/uploads/2011/06/021.jpg 134 250 Dogs and pups Magazine http://www.dogsandpupsmagazine.com/wp-content/uploads/2017/05/1254nal.jpg Dogs and pups Magazine2011-06-18 05:47:432014-02-07 17:40:32Amazing Akitas! Our heart bleeds when we witness the life of our loved ones slip away from us. I also stared at the startling reality when my little white kitty Kalpaka fought with the messenger of death. But I was fortunate to get this bundle of joy back and fill my life again with happiness. I met Kalpaka accidentally on the pavement when I was a volunteer with a local cat shelter three years ago. He was breathing hard from a severe upper respiratory infection and looked half starved. A man at the pavement teashop told us that he survived mainly on biscuits thrown to him. I picked him and brought him home and fed him. Slowly he started responding to medications and seemed to do fine. But soon, I noticed that his stomach looked enlarged, and his breathing laboured. I rushed him to the vet and further investigations revealed that he had an enlarged liver and ascites. He had to be given small doses of lasex every second day to clear the fluids in his system. Since he needed personalized care, I didn’t have the heart to leave him at the shelter and so Kalpaka stayed with us. With the help of my vet and a senior homeopath, Kalpaka returned to life like nothing had happened. What is more interesting, he did not seem to need the lasex anymore. From a heavy cat who puffed and panted every step of the way, he became more active (although he still prefers the lift to the stairs and is known as the lift cat!). We are quite sure it was the diet of biscuits (rich butter biscuits!) that made him ill, and the cat food that restored the balance gradually! Today Kalpaka still purrs like a busy engine, loves to bully the younger cats, and has the softest corner in my heart! !